We take a look at some of the mobile games updated for Easter this year. As we head into Easter weekend, many developers have updated their mobile games with content fitting the season. Here’s a look at a few of those updates. Cloud Raiders (iOS, Android, Windows Phone, Amazon) – A strategy title from Game Insight, Cloud Raiders has been updated with two weeks of seasonal events, including two new bosses and three new enemy types to defeat. 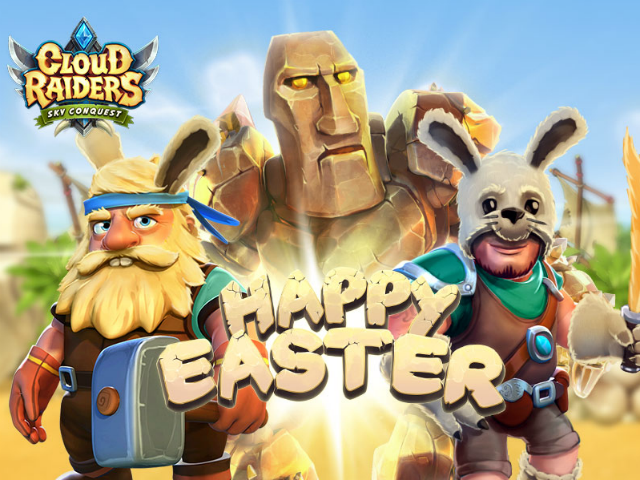 Players can become extra festive with an Easter Island skin, or unlock “themed buffs” for their game. Finally, players will go head-to-head with a Titan Crab enemy to unlock a unique tower that won’t be available after the seasonal events end. Sunshine Bay (iOS, Android) – In Game Insight’s resort-building game, players can join Adele on a quest to stop the Faberge Egg thief from taking off with the game’s treasures. At the same time, players will hold a convention for famous detectives, build their own agency and collect eggs for their game. Airport City (iOS, Android, Windows Phone, Amazon) – In this airport-management game, players will build new farm markets and collect eggs to unlock the Dali Theatre & Museum. “Cute and fluffy bunnies” have also made their way into the game. Paradise Island 2 (iOS) – Another resort-building title, Paradise Island 2 now allows players to take part in an Easter Egg Hunt and build holiday-themed buildings, including restaurants, museums and hotels. Mystery Manor (iOS, Android, Amazon) – This hidden-object game from Game Insight has been visited by the Easter Bunny, who gives players 60 new quests to complete. Gamers will interact with five new monsters, and they can complete five new Easter-themed collections. In addition, players can open Easter Eggs with their friends, and may eventually receive a “unique treat” from the Easter Bunny himself. 2020: My Country (iOS, Android, Windows Phone, Amazon) – This city-building title offers more than 20 new spring buildings and decorations, including flower beds and cake shops. Players have new quests to complete as they welcome the Easter Bunny in their towns, and they can “prepare various special surprises” for their citizens. The Tribez & Castlez (iOS, Android, Amazon) – In this medieval city-builder, players can send special Easter greetings to their friends. Gamers can also find basket-carrying rabbits, and if they find enough, they’ll unlock a mystery prize. Mirrors of Albion (iOS, Android, Windows Phone, Amazon) – Another Game Insight hidden-object game, Mirrors of Albion has been updated with a new scene: the Easter Park. Players will meet two new characters, and they can complete 21 new quests and a series of four new collections in this event. High School Story (iOS, Android, Amazon) – This high-school-simulation game has been updated with a themed, premium quest set, which sees gamers participating in a schoolwide Easter egg hunt. CastleVille Legends (iOS, Android, Amazon) – Zynga‘s medieval city-builder has been updated with a unique Easter event, the Great Egg Hunt. While it has egg in the title, the event doesn’t focus on carrots and rabbits; instead, players level 19+ will complete four chapters of quests as they retrieve Violetta’s stolen dragon egg and collect shiny gems with the help of Marigold, a limited-time hero character. Farm Story 2 (iOS, Android) – Storm8‘s farming game has been updated with an Easter Egg Hunt, as well as limited-edition prizes, like an Easter Egg Patch and Stuffed Easter Bunny. Players will need to find the eggs hidden around their farm, and can turn them in for prizes. Limited-time quests are also available. EggMaster (iOS) – With a name like “EggMaster,” it’s no surprise this “clicker” has been updated for the holiday. The game has been given a visual overall for Easter, and also allows players to tap on the new Easter Chicken to receive eggs.